The heater is placed thus only the used area is heated. If possible it is recommended to mount several heaters so that the heat is given off from several sides. It is also recommended to mount the heaters so that the heat rays are coming from the coldest direction, e.g. thus the heaters are pointed towards the wall at the terrace. See also the installation unstruction. The necessary output depends on the installation height, air temperature and duration of the stay, i.e. a high installation height, low surrounding temperature and long stay requires a high output. An installation height of 2 m, an air temperature of 15°C and a 2 hour stay requires an output of 500-750 Watt/m². TA – an universal Infratemper radiant heater for both indoor and outdoor use. The heater is made of electroplated steel plate covered with polyester powder paint. The reflector is made of mirror finished anodised aluminium. The TA series is splash-proof and is therefore suitable for outdoor use. 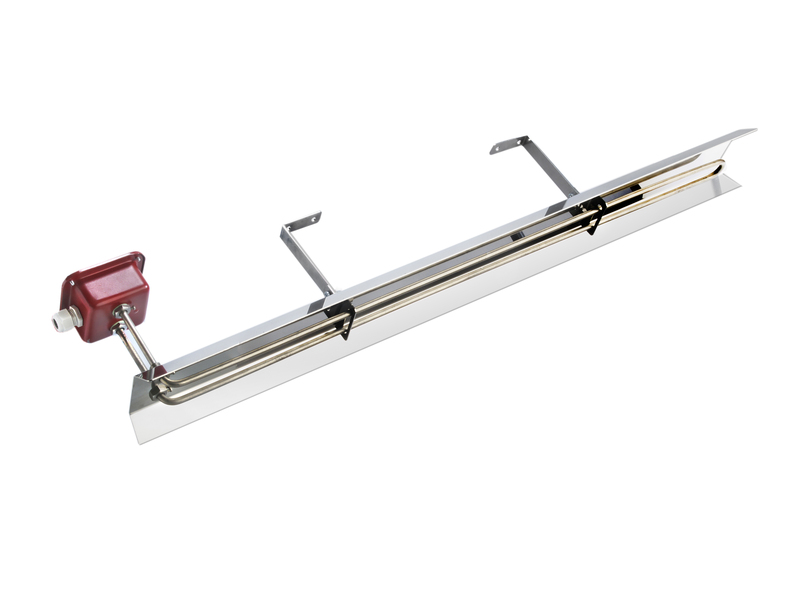 TA-R – an adjustable Infratemper radiant heater suitable at places where it is desirable to regulate the output. The two heating elements in connection with the built-in switch enables regulation of the heat with 1/4, 1/2 and 1/1 output and is therefore cost effective. IHS – Infratemper radiant heater is made of stainless steel and surface coated aluminium. The IHS series is IP54 and is thus suitable for application in e.g. the fishing and canning industry, at dairies and abattoirs. SINDSTRA – For drying of casting moulds in the plastic industry: paper in the graphic industry and seeds and grass in the agricultural sector. Special models with quartz glass infrared elements in short-, medium- or long-wave lengths and stainless steel elements can be supplied with adapted constructions and output. assemled in a water-proof connection box (IP54).